They rank among the largest wooden structures in the world. Step inside one, and the vastness of the enclosed space—6.8 acres contained within a 17-story parabolic roof—confuses the eye. Only photographs of the hangars taken during World War II, when they housed the U.S. Navy's Airship Patrol Squadron ZP-31, can begin to make sense of the cavernous buildings. Built by the U.S. Navy between 1942 and 1943 on land seized from the sprawling Irvine Ranch, each hangar sheltered six K-class airships from the elements. These helium blimps—built by Goodyear—patrolled coastal shipping lanes. They were 246 feet long. They could fly up to 78 miles per hour, with a range of 2,200 miles. They carried depth charges and a .50 caliber machine gun and are credited with deterring Japanese submarines from prowling the waters off the California coast. A wartime steel shortage necessitated wood construction for the hangars, designed by Navy engineer Arsham Amirikian. Each contains 2.7 million board feet of fireproofed Douglas fir, held together by 79 tons of bolts and washers and 30 tons of ring connectors. Fifteen other airship hangars—only five of which survive—were built from the same design, but the natural setting of the Tustin structures presented several unique construction challenges. Santa Ana winds often howled over the plains of the Irvine Ranch. Twice in early 1943, gusty winds collapsed the partially built hangars. The high water table beneath the facility was also a problem; workers compensated for the marsh-like consistency of the ground by pouring 1,600 concrete piles 48 to 65 feet into the earth. 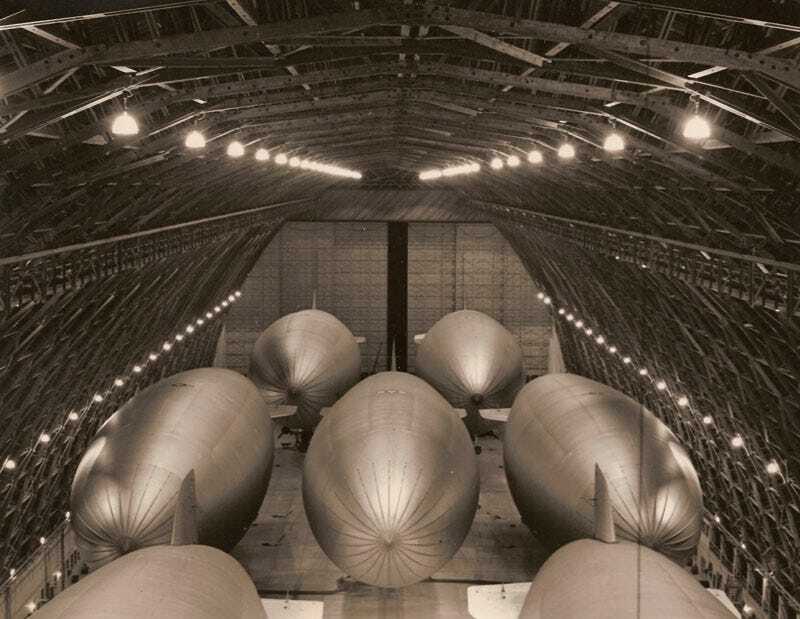 Airships continued to moor inside the hangars through 1949, when the Navy decommissioned Naval Air Station Santa Ana, as the facility was then known, and disbanded its dirigible warfare program. In 1951, the Marine Corps repurposed the now-obsolete blimp hangars as oversized helicopter sheds, but since 1999, when Marine Corps Air Station Tustin closed, uncertainty has clouded the hangars' fate. One will likely be demolished, its massive footprint to be carved into a new housing tract. The other is slated to anchor a new regional park, but recent damage to the hangar's roof has cast doubt on the park plans. For now, the immense hangars continue to recall a time when ships were lighter than air. Top image courtesy of the Tustin Area Historical Society.